Morocco is a surfers paradise with the Atlantic coastline offering up plenty of surf spots for all levels of surfer from friendly sandy beach breaks for beginners, through to the more challenging point and reef breaks for the intermediate/advanced surfer looking for a more challenging wave. Whatever your level, our experienced and knowledgeable local team mean that you can develop your surf skills in a safe, friendly and fun environment. Imouran Surf Camp gives you the ultimate space to relax with lots of communal areas to meet fellow travelers from poolside on the ground level, up to the two beautiful rooftop terrace spaces equipped with chill out areas to socialize and unwind after a great days surf. There is wifi, free onsite parking as well as a 24-hour reception. Our qualified surf teachers offer you the best tuition around, coupled with our small group’s policy which means our surf lessons groups have no more than 4 students per instructor allowing you to really progress and get a more personalized surf experience. We don’t want you to get lost in the crowd. Whether it’s to learn a new skill or pursue your surf passion all whilst soaking up the friendly Moroccan culture – let us help you plan an unforgettable surf adventure. We are open all year round and welcome all ages and surf travellers to our fun, friendly and experienced surf camp – we cannot wait to meet you! 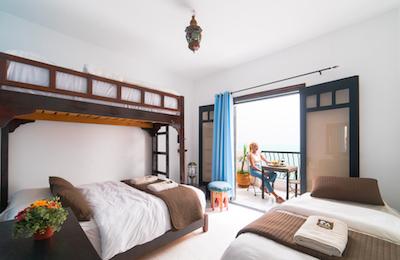 The traditional Imouran Surf Camp layout of our accommodation means that all the rooms are based off a central courtyard surrounding a peaceful pool and garden, as well as two beautiful roof terraces offering great communal areas to relax and socialize. All rooms are en-suite with bed linen, shower towels and daily servicing provided. Our all-inclusive surf packages include all of your meals, breakfast, lunch, and dinner! We start the day with a tasty and delicious breakfast buffet with a range of food options including eggs, cereals, bread, spreads and fresh seasonal fruits as well as tea, coffee and juices. We take our lunches picnic style at the beach with a mix of sandwiches, salads, and pasta along with a selection of seasonal fruits, nuts and dates. Lastly, our dinners – they are big, hearty and packed with healthy Moroccan produce and flavors. Please note we are able to cater for all dietary requirements. If you have any specific needs just let us know on booking and we will make sure you receive tailored meals throughout your stay with us. Each week we have one beach bonfire party after dinner – come to join us under the stars, around the fire listening to great music with great company. Join our surf school for daily surf lessons, with our all-inclusive surf school packages we provide you with daily surf to the best surf spots of the day! We offer all-level surf packages ranging from first time surfers through to the more experienced advanced surfer looking to find the best spots with the help of our knowledgeable local surf guides. We start the day on the search for the best surf spot for our pupils, after breakfast, our cars leave the surf riad and head directly to the beaches to check the local spots. Once a spot is decided, we pitch up for the day with our umbrellas providing you not only with a landmark but also shade. We provide you with all the surf kit, lessons, and theory to help you spend a week progressing on the waves. It’s our priority is to make sure you learn to surf in a safe and supportive environment, with group sizes of no more than 4 students per instructor. We include free surf photography and personalized surf feedback to help you improve and progress. Our guiding package is for the more advanced surfer looking for transportation and local insight to find the best local surf spots of the day. We surf the tides with sessions being split between one, two or even three spots in one day. We guarantee that no day will be the same, and we hope you will catch some rides to remember – even better our goal is to also get you some surf photography, so you can take some shots home with you. We believe that yoga and surfing are a beautiful combination which is why we like to offer daily 60-minute vinyasa flow classes for all abilities. Why not join us on the mat to stretch out and loosen up those surfing muscles, a perfect way to round off your day of surfing – mind, body and soul. We have a great partnership with a local stable where all horses are well cared for and housed just a short 10-minute drive from our camp. They offer beautiful sunset horseback rides along the beach for all levels of experience – walk, trot, canter or gallop, there are rides and horses for all levels. The large bustling Agadir Souk is located at just a quick 20 minute from our surf house and a great way to pass an afternoon walking around the indoor and outdoor market stalls and exploring the wide range of traditional crafts, spices, and foods. Test your bargaining skills, sample teas and pick up some truly unique Moroccan souvenirs. Aourir, also known by locals as Banana Village due to the banana plantations and many stalls adorning the streets, is our neighboring village. Every Wednesday it’s the local market day, offering up a very traditional Moroccan souk experience. Join us in shopping like a local! Stroll around this marketplace with its abundance of stalls selling the best seasonal produce, alongside nuts, dried fruits, olives as well as rugs and jewelry galore. We love the Wednesday souk! A massage is a great way to treat yourself after all your surfing – why not indulge in a full body massage, choosing from a relaxing massage through to something a little stronger. Want to go a little more into the traditional culture, then book yourself a traditional Moroccan hammam and scrub in the private steam room where black olive soap and gommage are used to scrub and massage the skin, removing any dead skin, leaving your skin feeling smooth and nourished. 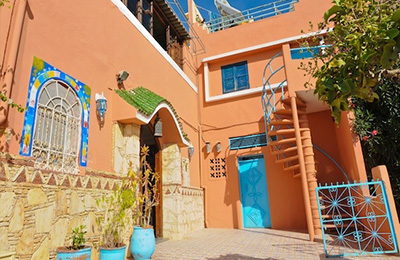 Want to carry on exploring Morocco, or to make your own day trip? No worries. We have a great partnership with a local car rental company. Clean and reliable rental cars are available for same day and advanced reservations. There are many beautiful cities and landscapes to explore and experience in Morocco – we are happy to help you with suggestions. Join us for an afternoon trip exploring the local surrounds by quad bike – take in the views from the beach up to the mountain tops! We believe our location gives you the perfect peaceful village vibe whilst being in easy access to a wide range of amenities. 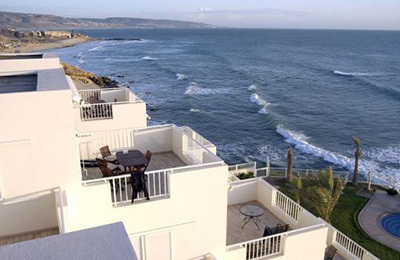 The nearest airport is Agadir al Massira which offers good connections to many mainland European cities, with a wide range of flight carriers offering daily and weekly routes. From this airport to our surf accommodation, it’s just a quick forty-five-minute drive through the city and then along the coast. Alternatively, Marrakech airport is roughly three and a half hour drive, or Essaouira a two and a half hour drive. If flying to Marrakech or Essaouira then you can either take a local bus to get to us, or we can help arrange you a taxi transfer (prices available on request). 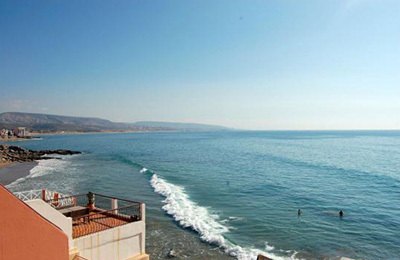 If you are flying into Agadir airport the airport pick up and drop off is included. Agadir city has a bus station which is serviced by many national inter-city routes. If you are already traveling around Morocco, or are flying into Marrakech or Essaouira the bus is the easiest and cheapest option to get to us. There are two bus companies which we would recommend you take, either Supratours or CTM. If you are arriving into Agadir by bus then the pickup and drop off is included.